St. Augustine sophomore and British Virgin Islands native Khari Herbert, ran a lifetime best, missed the territory’s 400m national standard by 0.11 seconds when he finished third in Saturday’s NCAA Division II Championships 400m in Allendale, Michigan. Herbert chopped his 400m best from 46.81 seconds at the CIAA Conference Championships earlier this month to 46.15, to threaten the 36-year old mark of 46.04, by BVI Athletics Association president, Dean “The Sportsman” Greenaway. Herbert was third in his preliminary heat to grab one of the fastest losers spots with the rights to the final after running 47.40 seconds. Herbert joined Lindel “Chef” Hodge as the BVI’s second NCAA Division II All American—but the first in an individual event. Hodge, competing for Cal State LA, earned the honor in the 4x400m Relay in 1983. Cary High School Sr. Lakeisha “Mimi” Warner won the 39th Golden South Classic 400m Intermediate Hurdles during the competition held in Orlando, Fla., on Saturday, leading three BVI athletes to top three placings. Warner had a winning time of 1 minute 01.07 seconds, lowering her best from 1:01.65 and eclipsed Jonel Lacey’s 1:01.26 as the fastest electronic time by a BVI athlete. She was second in the prelims in 1:01.96. Pat Archibald’s 60.0 seconds hand time mark from 1982 is the national standard. Top Notch Track Club’s Akeem Bradshaw missed winning the Classic Boys Long Jump by ¼” with a personal best leap of 7.35m (24’1¾”) to break his own National Scholastic mark of 7.26, set at this year’s Carifta Games. His mark also moved him to No. 6 on the BVI All Time List. Sprint Tech Track Club’s Tarika “Tinker Bell” Moses came up .07 seconds short of finishing second in the Classic Girls 800m and placed third in 2 minutes 11.62 seconds, as several of her club mates also turned in credible performances. L’T’Sha Fahie was eight in the Classic Girls 100m final in 11.95 seconds after running 11.91 in the prelims. She ran a personal best of 24.80 seconds for fourth in her 200m heat. Top Notch’s Nelda Huggins was third in her 200m heat in a non advancing 24.45. Deya Erickson ran the second best 100m Hurdles time of her career to place second in the Classic Girls event prelims in 14.17 seconds, but drew a false start in the final. Judine Lacey recorded a 400m personal best of 57.65 seconds in her Classic Girls heat, while Top Notch’s Kelsha Fortune finished sixth in her section in 1:02.14. Arianna Hayde had a best jump of 5.04m in the Classic Girls Long Jump and settled for 13th overall. Fast Lane’s Shanakay Wheatley had a best bound of 10.92m in the Triple Jump with a +3.5 tailwind, to finish eight in the Classic Girls event. The Sprint Tech 4x400m Relay quarter of Lacey, Warner, Fahie and Zacharia Frett, ran 3 minutes, 52.05 seconds to finish second in their heat and sixth overall. Fast Lane’s Kyron McMaster had the second fastest time in the 400m Intermediate Hurdles prelims of 54.60 seconds, but got home in 1:06.03 in the final. Aided by a +2.9 meters per second tailwind, K’Cei Moses ran 11.23 seconds to place seventh in his Prep 100m heat, while Khoy Vanterpool was timed in 12.23 for eight in his heat. 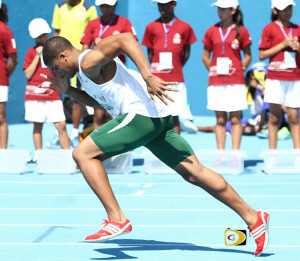 The wind also affected Moses’ time in the 200m, where he ran 22.67 seconds for second in his heat, with a +3.2 tailwind. Fast Lane’s Ronique Todman ran 22.41 for second place in his section—the seventh best mark overall—which had a legal 1.2 wind reading. He finished seventh in the 400m after running 50.25 seconds. Joshua Hill was third in his Prep 400m heat in 52.55 seconds while Jevon Smith was also third in his section in 53.57, then ran of 2 minutes 17.56 seconds in the in the 800m to place fourth in his heat. Both marks were personal bests. In Arizona, a slight ankle strain has affected Eldred Henry’s performances in two days of competition in the Tucson Elite Classic. On Thursday, Henry had one legal mark in the Discus Throw of 50.47m to finish eight and he was 10th in the Shot Put with a 17.08m measurement. He heaved the Shot 18.88m on Saturday on his second attempt—and fouled four others—on a bum ankle that kept him out of the Discus. Competing in the Ponce Grand Prix in Puerto Rico on Saturday, Chantel Malone had a season’s best leap of 6.37m in the Long Jump to finish fifth. At the Hampton International Games in Trinidad and Tobago, sprinter Tahesia Harrigan-Scott was second in the 100m in 11.59 seconds while Karene King finished fifth in 11.79. She was third in the 200m in 23.78. Jonel Lacey ran 1:02.25 in the Jamaica Athletics Administrative Association All Comers meet 400m Hurdles. She was second in her heat and fifth overall.